Photo and caption posted on facebook by a cat owner who had their cat declawed at Houston Humane Society. Most of you have heard the shocking news. Houston Humane Society declaws cats and kittens at their “Wellness Clinic” for cat owners in Houston and also for people who adopt HHS cats. Houston Humane Society added this disclaimer this month, September 2016, to their website next to their price for declaws. 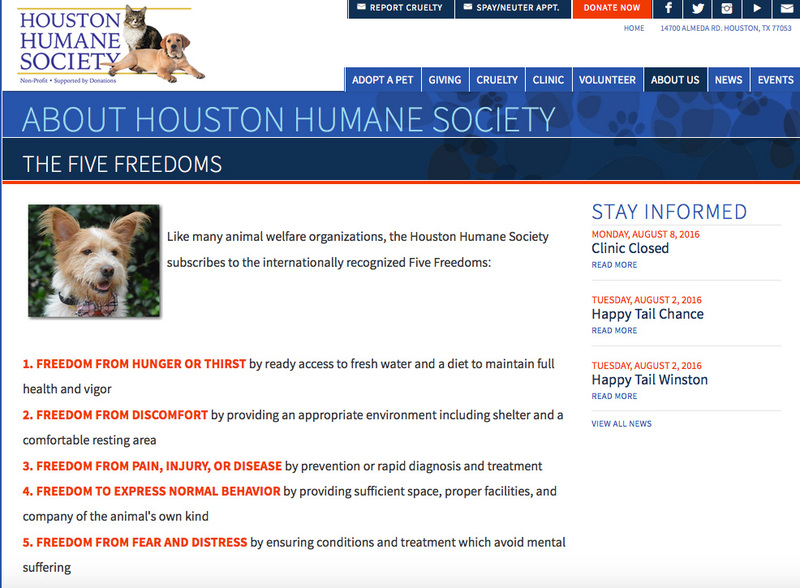 Let me first say that Houston Humane Society does do a lot of really good things for animals at their organization. But sadly they are not doing what most all other humane societies in America are doing, and that is educating cat owners about the negative aspects of declawing and counseling them about the ease of using the humane alternatives like scratchers, soft paws, and deterrents. Yet they somehow justify doing this inhumane, cruel, and mutilating procedure to cats. 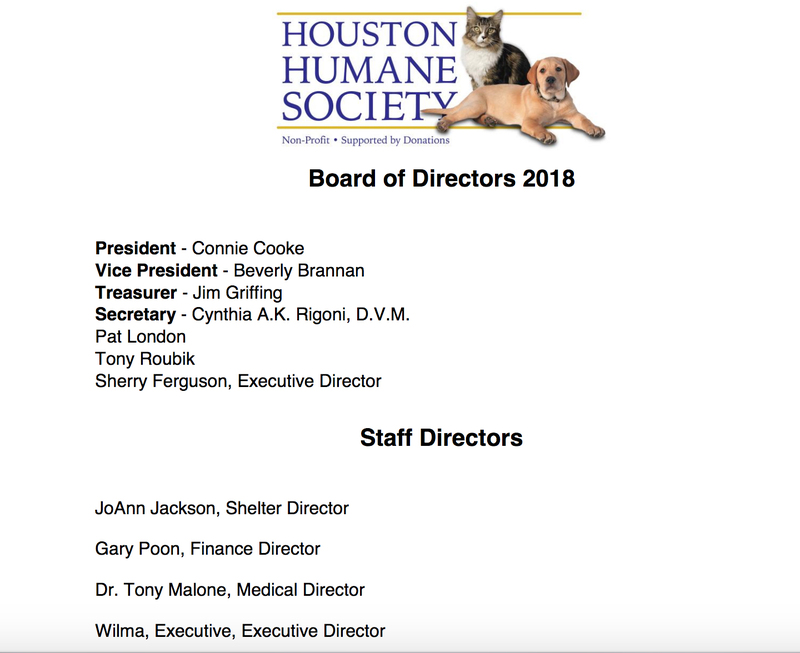 I have done months of investigating this Houston Humane Society declawing issue and have reached out to some of the people in charge of HHS, their PR staff, and also members of the board of directors at HHS to try to get an answer about why they declaw cats. Not ONE person has gotten back with me for this story. So I needed to try to find information that would explain why HHS has this very antiquated and inhumane mindset towards declawing. I asked my FBI (Feline Bureau of Investigation) team to help out. I wanted to know who sets the declawing policy at Houston Humane Society? Usually it is the board of directors at these kind of organizations. I reached out to all the board members that I could find their contact info on, and even Sherry Ferguson, Exec. Director, but not ONE of them returned my emails. I also reached out to the current secretary of the HHS board of directors, who is a veterinarian and owns a cats only veterinary practice, Dr Cynthia Rigoni. She was even the President of HHS in 2004-2006 so she must be very influential at HHS. She never returned my email or took my phone calls. I had my FBI team look into how she addresses declawing at her own All Cats Veterinary Clinic in Houston. Maybe that would help give some insight of why HHS declaws cats. 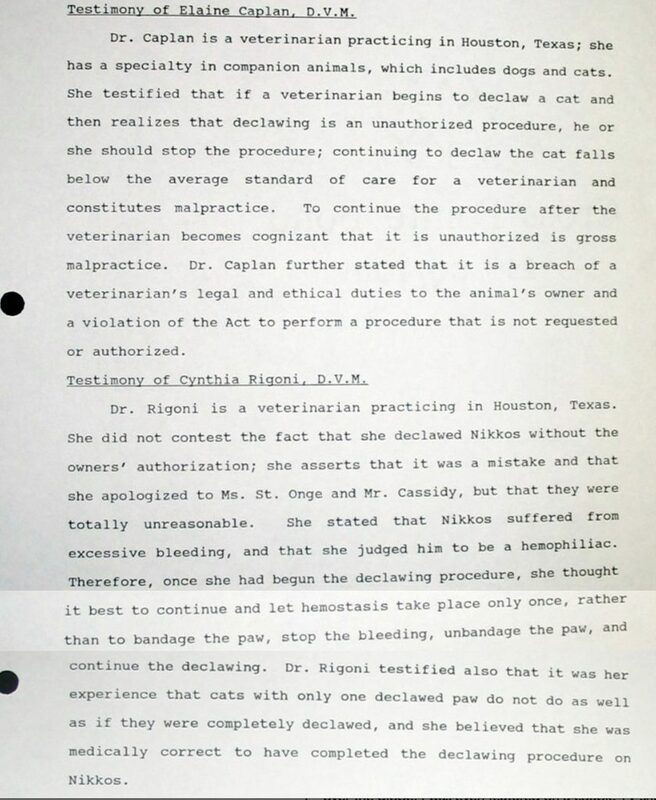 Here is the only thing that my FBI team found online in regards to declawing at Dr Cynthia Rigoni’s practice. 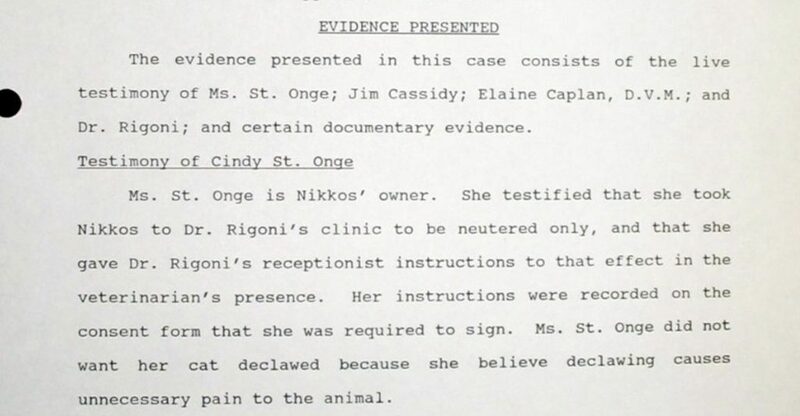 Dr Rigoni has been doing declaws for a very long time, over 25 years. So I tried a few more times by phone calls and one more email to reach Dr Rigoni for a comment about who sets the declaw policy at Houston Humane Society, how declawing Nikko affected her, and other questions about declawing but I never got a reply. This is a very serious issue so I finally spoke to one of her employees who was happy to talk to me on the phone about this story but didn’t want her name used. I will call her Employee T.
Employee T was proud to tell me that she works at the front desk, has done technician work, has worked in the food industry , has been working in the pet industry and the animal industry, and has been showing cats for over 20 yrs. I asked her about their declawing policy at All Cat’s Veterinary Clinic and asked why they don’t counsel owners, why they suggest declaws with spays/neuters, why don’t they tell cat owners the truth that it is inhumane and mutilating to declaw a cat, or suggest humane alternatives to cat owners. I said, you say that there are no negative consequences, no problems doing it, you say that you declaw cats as old as 18 yrs old and any age is fine you never say that there is anything wrong with declawing your cat. I said the majority of cats can have scratchers, soft paws, and use deterrents and can be trained to use scratchers and you guys could be educating the cat owners about this fact. Told her that they declaw cats as young as 3 months old who don’t even have scratching issues. You do know that cats can be trained and you should be counseling the cat owners about these things. When cat owners ask you if there are any negative consequences, you say no and you say it’s fine. When I asked why Dr Rigoni declaws most of her cats. Do you know the rest of the world doesn’t declaw cats. Why does she declaws her dogs or other people’s dogs? Employee T said, “your information isn’t true. They are including the number of animals that have to be put down for humane purposes which means they have been hit by a car or they have a broken back, those aren’t true numbers. If you look at the true adoptable cats and dogs that are put to sleep, the numbers are going to be a whole lot different. Those are animals who are put out of their misery before they die on their own.” She said that HHS is responsible for all of Harris County in the city of Houston and that’s a huge area with a large number of cats and dogs they are responsible for and that you have to take that into consideration and look at apples to apples. When she started to bring up other questions like, “If there was a burning building and there was a cat in it and a baby, who would you save?” I knew that it was time to end my interview. She obviously was doing everything she could to deflect the real issue which was about declawing cats. Then she said that I’m writing a sensational and fictional story. This story has all facts in it. 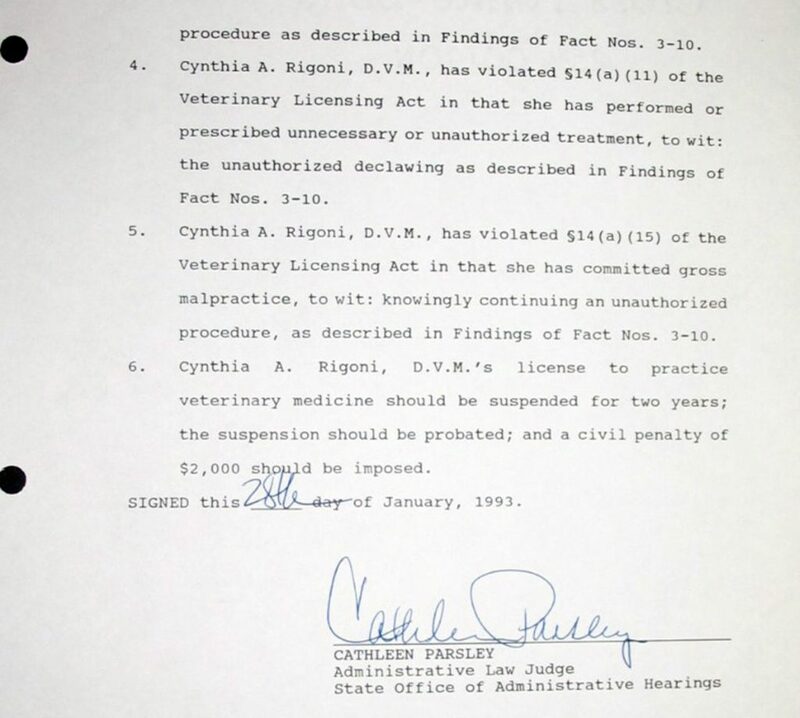 I wanted more answers so I had my FBI (Feline Bureau of Investigation) team call Cynthia A Rigoni’s veterinary clinic as a “first time cat owner.” . They wanted to see how Dr Rigoni addresses declawing at her practice. The FBI team member said they were adopting a friend’s 6 month old and 2 yr old cats and the 6 month old needed a spay and that they never had a cat before so wanted advice. DETAILS OF ALL THESE COMMENTS ARE BELOW IN THIS STORY. August 2016 – Employee 2- J- Has known Dr Rigoni since 1979. “First time cat owner” called and had a 6 yr old, 20 lb cat that they got from a friend. Asked the employee if it was inhumane since another vet said they wouldn’t do it to a cat that old or that heavy. August 2016- Employee 3-T- First time cat owner wanted to talk to Dr Rigoni to see if it was humane and ok to declaw their cats. First time cat owner asked if they could just ask some questions before she does the declaw. First time cat owner asked if declawing bad for the cat’s health and well being. August 2016- Employee 4- E- Office manager- Asked about getting a 6 yr old 20 lb cat declawed and was nervous about it and asked if their cat would be ok.
From the investigation of this story, I realized that there are thousands of pro-declaw veterinarians in North America who are deceiving the public about what declawing is and telling their clients that it isn’t harmful or bad for the health and well being of a cat. The nice folks with the Texas Board of Veterinary Medical Examiners helped me with this story and said that veterinarians must be held to the honesty and integrity rule. 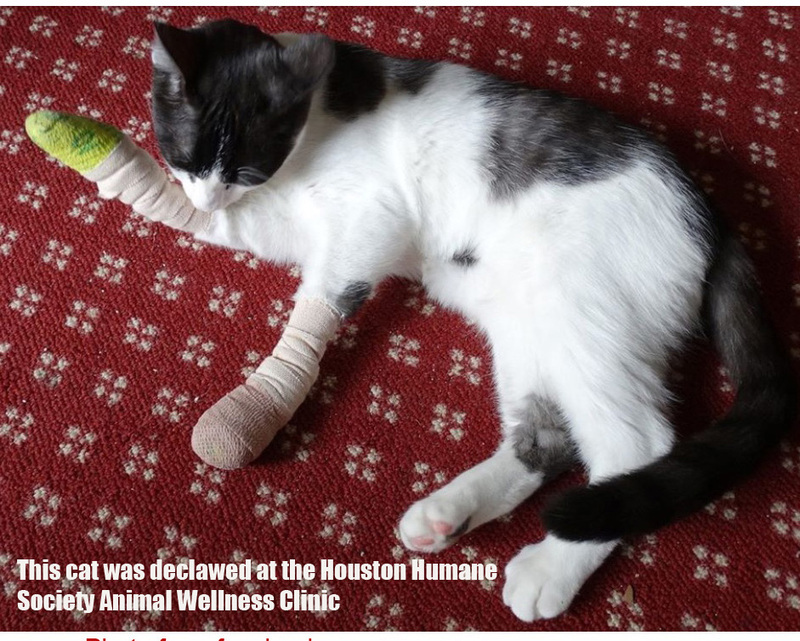 Anyone can file a complaint if they find out about a veterinarian in Texas who is lying about declawing or who is deceiving the public about declawing. Here is the link to the complaint form Texas Board of Veterinary Medical Examiners official Complaint Form. They were kind enough to also send me these helpful links for this story and this information that would pertain to how this practice was addressing declawing and the misrepresentation of the declawing procedure. 3. Call your own or other local veterinary clinics that declaw cats, as a new customer or first time cat owner, and ask about prices for declawing and say that you want to to know all the facts about declawing . Ask them about their method of declawing and if your cat will be ok after having it done. Ask them questions like, is declawing your cat ok for the health and well being of your cat. Ask them if there are any long term negative consequences to declawing. Ask them what kind of pain management they use and if their vets are skilled at declaws and how many do they do a month. Check the laws about recording the phone conversation in your state. Eleven states require the consent of every party to a phone call or conversation in order to make the recording lawful. These “two-party consent” laws have been adopted in California, Connecticut, Florida, Illinois, Maryland, Massachusetts, Montana, New Hampshire, Pennsylvania and Washington. 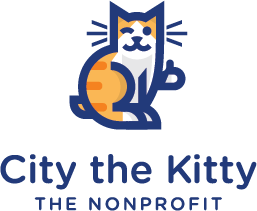 Save the recording and transcribe the notes and email them to me at citythekitty@gmail.com with the state and name of practice in the subject line. With your permission, this info will be used anonymously in a documentary and YouTube video for educational purposes. 5. 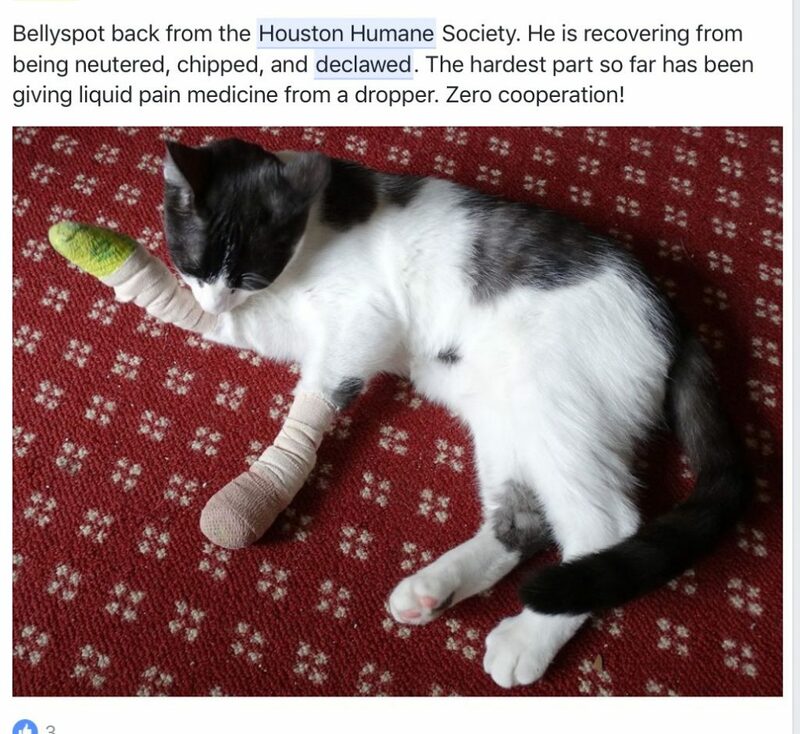 Start a petition to ask Houston Humane Society to stop declawing cats and start educating the public in Houston about the facts about declawing and counseling them about the humane alternatives. Houston Humane Society has this on their website. I would say that declawing goes against 4 of these freedoms. AS USUAL I MUST REMIND YOU OF THIS DISCLAIMER. Please don’t threaten anyone involved with these stories. We must do the right thing and take the high road and be respectful. It is wrong to threaten them in any way plus they will twist things around and play the victim. We know that the only victims are all the kitties that are being unnecessarily and cruelly declawed. We MUST continue to shine light on this cause and share all of these stories so that we show the truth about what is going on. We MUST continue to educate cat owners who are being deceived by these pro-declaw veterinarians and veterinary professionals and who are NOT being told about how declawing is mutilating amputations, not good for the health and well being of their cats, how it is inhumane and very painful, and how there are ALWAYS humane alternatives that they can use instead of declawing. Soft paws, scratching posts, nail trims, and deterrents are ALL better than declawing and they work! The way that we make positive change is through peaceful and respectful actions and words. When you lash out and are threatening, it hurts our important cause and makes us all look bad, and in turn saves less kitties from this very cruel and inhumane procedure they call declawing.